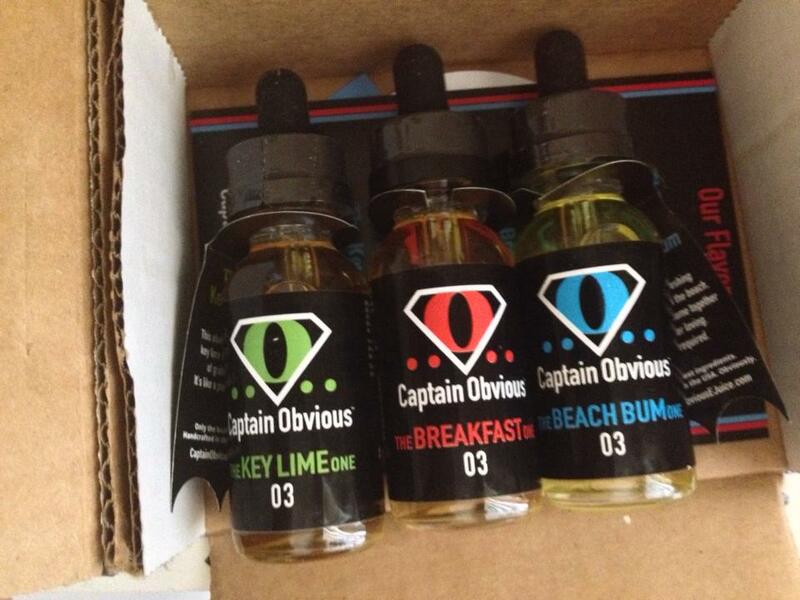 Today I'll be reviewing Captain Obvious E-Juice, a company that's very smart in knowing that less is indeed more. What I mean by that, is that they have narrowed their options to only three offerings.. The BREAKFAST One (fruity, looped cereal *wink wink*), The BEACH BUM One (a tropical fruit blend), and The KEY LIME One (Key Lime pie). These flavors come in your typical 30ml glass dropper bottle with one little inclusion: cute little capes cut from thin cardstock that offer you their description of each flavor. Gimmicky? Maybe; but I actually like a company that takes out the guesswork of their flavor profiles. There is no VG/PG indication on the bottles, but from how thick the juice is I can definitively say they are, in fact, Max VG. On to the review..
Disclaimer: I must say before giving my opinion on this particular flavor that I am rather burnt out on cereal juices at this point. Last year, a ton of companies flooded the market with varying recipes of fruit-laden breakfast cereals. Some good, some bad; but all the same just a bit too many options were present, and still are. Regardless, it's been about a month since I've had a fruit cereal juice, so my taste buds were ready for this one. It's pretty good. Although I do have a few minor complaints. Where's the milk? I'm not trying to be rude; but I like milk with my cereal, and there's just no creaminess to be had with this flavor. Secondly, there's too much focus on the citrus here. Just about the only thing I taste is lemon and lime with some sugary cereal at the base. It seems to me that a lot of companies forgo trying some actual fruit cereal before trying to copy it in juice form, because there's a certain flavor present in these cereals that almost always is absent in these juices: GRAPE. It's actually a pretty large flavor component in these cereals too. If I don't taste grape, I'm sorry fellas, but I won't buy it again. This is still a good flavor, but sadly, there are better options out there. I have nothing bad whatsoever to say about this flavor. Overall, a standard tropical fruit flavor that consists of mostly pineapple, a hint of coconut, and a undefinable blend of other fruits to fill it out. Very pleasant, light, and extremely tasty.Only negative is that it just doesn't stand out from the pack. I've had flavors just like this from several companies in the past and it's not like this flavor profile is hard to find. If you like piña coladas, but not getting caught in the rain, this might be the juice for you. I'm torn on this one. While it very much tastes of a potent Key lime, unfortunately it lacks the pie element almost completely.When I think "Key lime pie", I invision a tart lime custard filling in a graham cracker crust, topped with dollops of whipped cream. Not here. There might be a faint ghost of graham lurking somewhere in the mix, but I can't taste any cream whatsoever. I really wanted to like this one too, but the overly powerful lime just eradicates any corresponding notes that should be front and present. If you'd sit on the couch and eat an entire can of key lime filling, you might want this juice. I'm sorry to say that I do not. 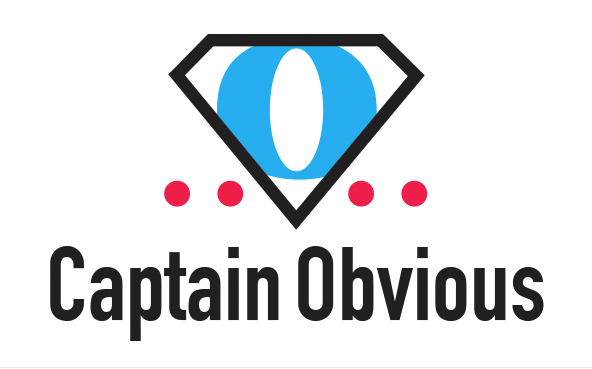 Overall, I give Captain Obvious a score of 3/5. I try and be as truthful as I can without being overly harsh in my critique, but sometimes it can be difficult. Newer vapers may fall in love with these flavors, but as I taste juice after juice, I find myself unable to resist comparisons to better juices I have tried. This tends to skew my reviews to a point. So I feel like I need to remind people that these reviews are just my opinions; and if you really want to know what a juice tastes like, you should probably try it for yourself.